I have played quite a few Gibson ES-335 guitars and their clones over the years, and many of them were very good, a few were excellent, and there were a surprising number of clunkers. The 1977 Yamaha SA-700 we are looking at today is one of the best. It is called the Super Axe, and that is not just a clever name. There were a lot of models in the Super Axe line, and their specs were all over the place. It was possible to get bare bones models, or high-dollar guitar with exotic woods and fancy electronics, so you could spend anywhere from a few hundred to a few thousand dollars to pick one of these up. More accurately, you would be spending Yen, because not many of these were exported. The SA-700 is the model that came closest to replicating the original 1958 Gibson ES-335. That was the first mass-produced semi-hollowbody guitar, and it has become a staple of the rock and roll diet. This Super Axe is finished in transparent persimmon poly over its maple body and mahogany neck. The body has the traditional ES-335 shape, and has one of the chunkiest blocks of wood I have seen in one of these types of guitars. This reduces feedback, but puts on the weight, and this guitar weighs in at around 8 pounds 12 ounces, which makes it about a half pound heavier than other Japanese ES copies I have seen before. This one is in very good condition, and appears to be all original. It has a plain top and the body is bound on the front and rear. 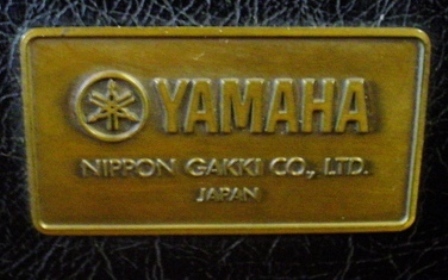 The hardware and electronics are first-class, with Yamaha-branded sealed tuners (made by Gotoh) and two PAF-style humbucking pickups. The controls are the same as a Gibson: 2 volume, 2 tone and a 3-way switch. It has a non-trapeze bridge and tailpiece as used on Les Paul models, which is fortunate as all of the tone on these guitars is found behind the bridge. The bound set neck has a rosewood fretboard and bound inlays, and it is quite a corker. Most 335s nowadays have slim taper necks, but this one has a chunky C shape to it. It is around 1 3/4-inches wide at the nut and 2 1/16-inches wide at the 12th fret. This is a real vintage-feeling baseball bat of a neck. The original frets are still in good shape, and I think the nut is original, though my guy had to do a little work on the nut to eliminate some buzz. This thing is 35 years old, you know. I said earlier that the SA-700 Super Axe was one of the best ES-335s I have ever seen, and that is true because it plays very well and sounds even better. The fat neck is so comfortable to play, and it has a great natural resonance and a ton of sustain. The pickups have got the creamy PAF tone nailed with no unusual noises, and this would be a good jazz instrument or fantastic a fantastic rock guitar. Nice, honest review. I've had a couple of these. Superb guitars. Thank you for taking the time and trouble to post.